Jeppesen today announced that the new-for-2011 Standard Horizon CP190/390/590 lines of chartplotters come pre-loaded with free C-MAP by Jeppesen coastal navigation charts covering all of North America and more, making these new, advanced navigation systems ready to cruise right out of the box. The C-MAP by Jeppesen navigation charts cover all of North America including Alaska, Hawaii, the Great Lakes and Canada. For boaters who choose to venture over distant horizons, coverage also includes the Bahamas, Caribbean, Cuba, Puerto Rico and Central America. The built-in charts provide boaters with important data including depth contours and spot soundings up to 30 meters, NavAids with icons and information, tidal station data and port information. 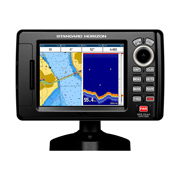 Standard Horizon’s 5-inch CP190i, 7-inch CP390i and 12-inch CP590 are also fully compatible with C-MAP MAX electronic charts, ideal for boaters who want a more robust navigation experience. Upgrading to C-MAP MAX unlocks a wealth of additional data and features, such as dynamic NavAids, dynamic tides and currents, Guardian Alarm anti-grounding technology, detailed harbor charts, aerial photos, access to the C-Marina port database and more. During a limited-time promotion, Jeppesen is offering a $40 rebate to boaters who purchase a new Standard Horizon CP190/390/590 chartplotter and upgrade to a C-MAP MAX chart cartridge. Consumers can get this rebate directly from Jeppesen by filling out the Jeppesen rebate form (provided in chartplotter packaging and at authorized dealers) and mailing the form to Jeppesen’s Cape Cod, Massachusetts office accompanied by receipts for the plotter and C-MAP MAX cartridge. For more information about C-MAP coastal navigation charts, the benefits of C-MAP MAX cartography, or questions about this limited time rebate, call 800.424.2627 or email us-customersupport@jeppesen.com. Jeppesen is a market-leading provider of vessel operations services and digital navigation solutions, based on worldwide vector chart data type approved to ISO19879, meteorological information and transmission technologies. Jeppesen offers a wide range of navigation and operations products and services to both recreational and commercial marine markets. Safety-conscious boaters and operators of vessels ranging from coastal to SOLAS class, rely on Jeppesen for innovative navigation solutions that improve safety and efficiency. Jeppesen is a subsidiary of Boeing Commercial Aviation Services, a unit of Boeing Commercial Airplanes. Jeppesen corporate information is available online at jeppesen.com.